Okay, not exactly. But, do forgive my absence (and this blurry photo). 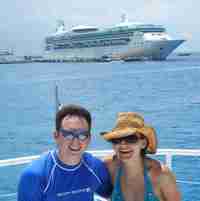 Jason and I escaped last week on a cruise, with no email and no cell phones. It was a much needed break from a hectic summer. More soon, once I recover, including a cruise and birthday recap! I’m going to Rhinebeck! My ticket has been purchased…so we need to find a time to meet up! Awesome! Where did you guys go? What did you think of the cruise?